Reverb is undoubtedly the most commonly used effects processor. Reverb is a natural characteristic of any enclosed room and is the result of sound waves bouncing off the walls, floor, and ceiling. A small room produces reflections that start quickly and end soon, whereas larger rooms, halls, or cathedrals have slower start times and the reflections last longer. This room effect enables you to place your track from front to back in the mix. You do this by varying how much of the affected signal you include with the unaffected one. For example, mixing a lot of reverb with the dry signal gives the impression of being farther away, so your instrument sounds like it’s in back in the mix. You can adjust several parameters when using reverb, which gives you a lot of flexibility. The following illustration shows what the reverb processor looks like in a popular computer-based system. Reverb allows you to add ambience to your instrument, giving it a more realistic sound. Algorithm: Whether you use a reverb patch within your recording system or a separate outboard reverb unit, you can choose the type of reverb that you want to use. You have the option of a room, hall, or plate (a type of reverb that uses a metal plate to create its sound). In addition, you can choose the size of the room (in this case, small, medium, and large). You may also be able to choose from a large pop-up menu of options, including algorithms created from samples of actual rooms (often called convolution reverbs). Decay: The decay is the length of time that the reverb lasts. Larger or more reflective rooms produce a longer decay. Predelay: A sound reaches your ears before the sound’s reverb does, and the predelay is the amount of time from the sound’s beginning to the start of the reverb, which is described in milliseconds (ms). Because reverb is made up of reflections of sound within a room, the sound takes time to bounce around the room and reach your ears. By then, you’ve already heard the sound because it came directly to you. Predelay helps to define the initial sound signal by separating it from the reverb. This parameter is essential in making your reverb sound natural. A small room has a shorter predelay than a large room. Predelay times generally range between 10 and 50 ms.
Density: The density parameter controls the level of the early reflections (the first few milliseconds of the reverb sound). Because the early reflections take less time to reach your ear than the main body of the reverb, you hear a thinner reverb sound to begin with, followed by the main reverb. The density parameter enables you to simulate different room sizes because the main section of a reverb takes longer to reach you in a larger room. The higher the density setting, the larger the apparent room size. Not all reverbs have this setting. 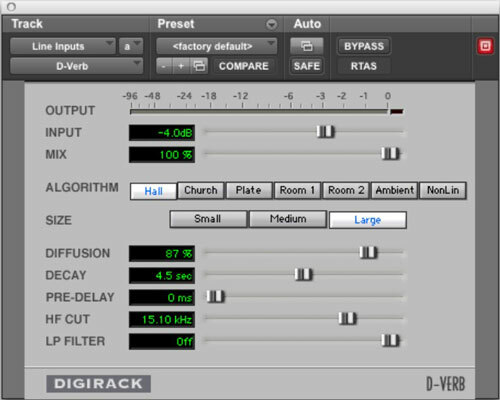 Some reverb processors don’t have a density setting. In such a case, this parameter is usually factory set and varies based on the type and size of room parameters that you choose. Diffusion: Diffusion affects the density of the reflections in the main section of the reverb sound. A higher diffusion setting results in a thicker sound. Think of the diffusion parameter as a way to simulate how reflective the room is. More reflective rooms produce a much higher diffusion. To simulate a less reflective room, use lower diffusion settings. Like the density setting, some reverbs don’t have a diffusion parameter; instead, it’s factory set and depends on the room type/size parameter that you choose. Hi Cut and Low Cut filters: These filters allow you to control the rate at which the high and low frequencies decay. Most of the time, the high frequencies decay faster, so being able to control this effect can result in a more natural-sounding reverb.